Coverack, Tresooth Holiday Barns in Mawan Smith, near Falmouth sleeps 2 people. Tresooth Cottages are the perfect Cornish holiday destination, situated a mile from the quaint village of Mawan Smith and just 3 miles from the sea faring town and port of Falmouth, with busy marinas, harbours and a stunning array of restaurants, cafes and shops. Small ferry services, with trips to nearby St Mawes and Flushing, plus a ’Park and Float’ service. The National Maritime Museum, Events Square and Pendennis Castle are open to the public daily with activities throughout the year. 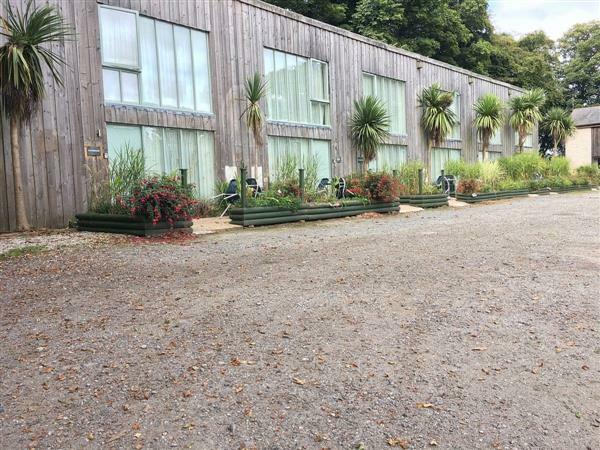 The area has many beautiful sub-tropical gardens including Trebah, Glendurgan and Trelissike. With some of Cornwall’s finest family friendly beaches including Gylingvase, Swanpool and Maenporth cove, all with bathing and gorgeous sandy beaches. Water sports, diving, sailing and golf are all nearby. Tresooth is close to the picturesque Helford River, with creeks and breath-taking coastal walks. The area is best explored by boat, daily trips are available from Falmouth, with the famous Ferry Boat Inn, small beach and gorgeous walks. These carefully converted traditional barns (refs 26934 [Lamorna], 26935 and 26936 [Penpoll]) offer all that you would expect from a modern home. Set around a pretty courtyard with its very own original working water well, large heated outdoor swimming pool with sun loungers, jacuzzi, sauna, games room, recreational lawn with volley ball and badminton and children’s play area with slides and swings.Woodland walks from the doorstep, including the nearby Argyle reservoir and water park with nature reserve, fishing and dog walking. Shop, pub and restaurant 1½ miles. All properties (refs 26935, W43920 [Mawnan], W43921 [Sennen], 30351 [Manacle]): Gas central heating, electric, bed linen and towels included. Freeview TV. DVD. Gas hob, Electric oven. Microwave. Washer/dryer. Dish washer. Fridge/Freezer. Wi-Fi. Landscaped grounds. Shared outdoor swimming pool (12m x 6m, depth 1.5m), open Apr-Sep. Sauna. Games room with wi-fi, pool table, table tennis and air hockey. No smoking. NB: Well in courtyard, pond in grounds. Ground floor: Living/dining room/kitchen with tiled floor. Shower room with toilet. Mezzanine floor: 1 double (6ft) bed. CD. Patio with sitting-out area and furniture. Parking (1 car). Holidays run from Friday to Friday. For a better idea of where Tresooth Holiday Barns - Coverack is, you can see Tresooth Holiday Barns - Coverack on the map below. Tresooth Holiday Barns - Coverack is in Cornwall; should you be on the lookout for a special offer, you can find all the special offers in Cornwall. It's always worth checking to see what is on offer at the moment. Do you want to holiday near Tresooth Holiday Barns - Coverack (26935), you can see other cottages within 25 miles of Tresooth Holiday Barns - Coverack; have a look to find your perfect holiday location.